Single vs Double Bevel Miter Saws – Which is Best For Your Needs? There are a lot of decisions to make when purchasing a miter saw: What size? Sliding or non-sliding? And lastly, single bevel or double bevel? Every smart tool buyer wants to buy the best tool for the job for the least amount of money they can get away with. Before you buy anything, think about the kind of work you’ll be doing with your miter saw. Knowing that – before you start shopping – will help you make the best choice. Let’s see how single bevel and double bevel stack up. A miter saw can cut boards in four ways: cross cut, miter, bevel, and compound. A cross cut is a 90-degree cut, straight up and down. A miter or angle cut cuts across the board at an angle, often 45 degrees, like you would see in the corner of a picture frame. A bevel cut angles through the thickness of the board, like you’d see on a doorstop. And a compound cut does the angle and bevel together. As the name suggests, a single bevel miter saw can only bevel in one direction. A single bevel saw will likely pivot only to your left, as you’re facing the machine, but won’t go past 90 degrees vertical. If you want to make a bevel cut in the opposite direction, you’ll need to flip the board over and saw again in the same direction. A dual – or double – bevel saw will bevel in both directions. As you stand and look at it, it can pivot both left and right. If you want to make opposing bevel cuts in the same piece of wood, the wood remains on the machine and you just swing the blade over. A dual bevel saw is a tool for a true craftsman. They are precise, high-quality machines. They are most often used to make custom, handcrafted trims and crown moldings – not a task for the rookie. If this particular kind of woodworking is your passion or your livelihood, you will never second guess the decision to buy a dual bevel saw. You will save time (and material you’ve messed up) with a dual bevel saw because you won’t be endlessly flipping your boards back and forth. Every time you rearrange the board and blade, not only do you use up your time, but you create an opportunity for your own human error. Again, if this is how you make a living, this is an easy choice. Then why would anyone bother with a single bevel? That double bevel saw you now have your eye on might cost you almost double what a single does. Ouch. The single will be lighter. Do you expect to be carrying this around to job sites? They are both portable, but this one is a little easier to move around. Are you making fancy crown moldings? If not, you probably don’t need a dual bevel saw. There’s nothing you can do with a dual that you can’t do with a single – it will just take longer and require you to pay attention to what you’re doing. If all you’re doing is slapping together standard trim boards, a double is unnecessary overkill. As we are fond of saying, the best tool is the one that is right for the job. Amateurs and DIYers probably don’t need a dual bevel saw, but serious professional carpenters or woodworkers might find themselves ready to upgrade. Think before you buy. 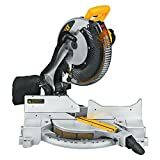 And if you just want to take a dual bevel saw for a spin to see what it can do, you can probably rent one from your local home improvement store. Electric vs Gas Chainsaws – Which is Right For Your Needs? Grizzly G0690 vs G1023RL: Which One’s Best? Chop Saw vs Miter Saw: Which is Right for Your Needs?